“I'm really looking forward to defending my title," said Lintin, who will also ride in the RST Superbike, RL360 Quantum Superstock and Monster Energy Supersport races at the TT. “It's going to be an even bigger race of attrition because the little twins are quite delicate things," said Lintin. “Nursing them around there for 150 miles at lap record pace could prove difficult. But I don't mind because the twins are quite easy to ride. It's the polar opposite to riding a big bike around there. The most tiring thing on a twin is concentrating and staying tucked in because it's all about momentum and corning speed. On a big bike it's physically demanding because of the 190mph speed and because you're doing six laps." But Lintin is out to prove himself on the bigger bikes too and that he is not merely a Supertwin specialist, starting with tomorrow’s Superbike and Superstock qualifying sessions..
“That's always in the back of my mind," he added. “Obviously you always concentrate on what you're strongest in. But this year I would like to push on more with the big bikes. Every year I feel I can go quicker, but then everyone else does as well, so you don't seem to end up any further up the finishing order. My ideal goal would be to get to the magical 130mph lap. But if everyone else is doing that pace, I may only get 15th or 20th." Lintin will face stiff competition in the big bike classes, with multiple potential race winners. 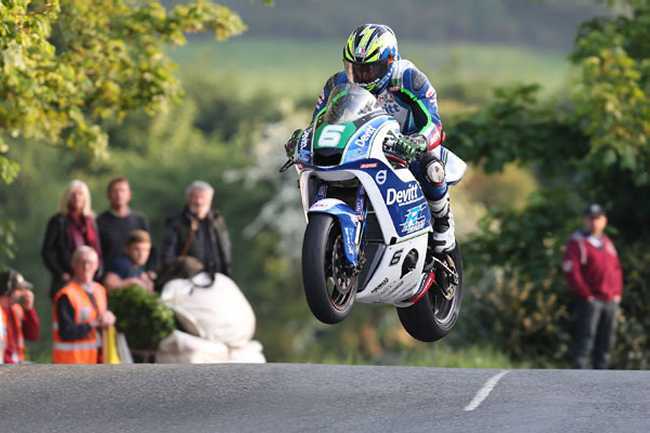 Lintin says Ian Hutchinson, who famously won five races at the 2010 event before suffering a career-threatening leg injury later in the same year, could be the man to beat. “I reckon Hutchy will take some stopping," he said. “He had a good year last year, he's on good bikes and he's riding in the British Championship regularly. But then there's John McGuinness, there's Michael Dunlop. There's no one person who stands out because there are five or six potential winners in each race on their day. That's what makes it so exciting." Ivan clears Ballaugh Bridge on his Lightweight bike.